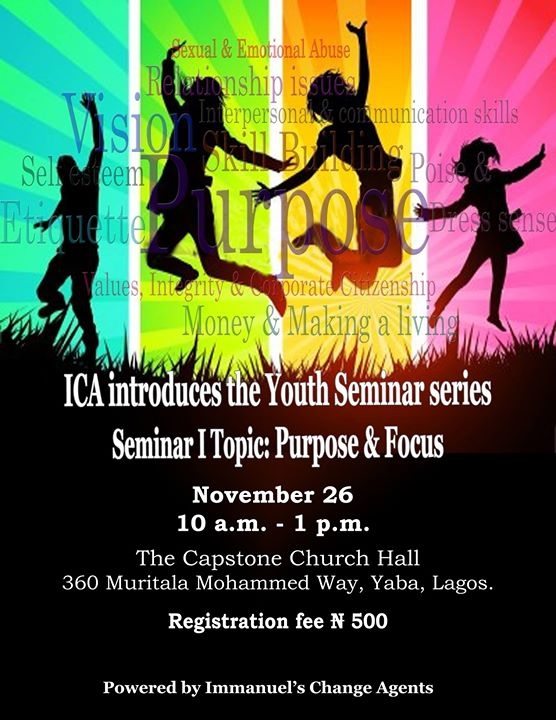 This is the first in the series of youth seminars on a range of topics dealing with life issues. The objective is to clear the fog and give clarity to the questions and attitudes that tend to stagnate us, as well as enable us chart a roadmap to a life of fulfilment and success. The seminar is free. The registration fee covers the cost of materials only. Please bring a friend along. Seats are limited; reserve your seats by sending an sms with your name to 08061357928. We look forward to seeing you there. Enai Agodo for Immanuels change agents.